The weather was beautiful here on Saturday. Get in the car, drive, drive, drive… arrive at the fairgrounds at 9:30. I went first to the skein competition table to enter my skeins. The more I looked at my 2-ply the less confident I became. I got stuck behind a woman who was entering 16 skeins! I swear she was the same woman I got stuck behind last year!! She turned around and said some nonsense to me about not standing there waiting. I can’t help it if you are hogging the entire table! More on this later when my skeins come back. I managed to obtain everything on my list in some form or another. Almost immediately I bought a huge box of Rambouillet roving. It’s not a fiber I’m terribly familiar with, but at $20 for the box, I couldn’t resist. However, after getting it home and trying it out, I’m not sure it was a wise decision. The spongiest, weirdest fiber I’ve ever experienced. Also bought a GORGEOUS white fleece, Bluefaced Leicester/Border Leicester cross. 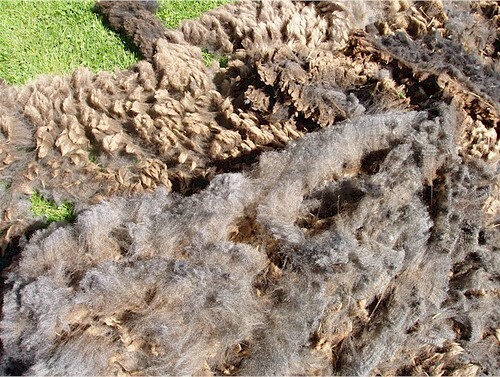 It’s from the same farm I bought Sage’s fleece from last year. She had his again; this one is from Marigold. So curly and soft soft soft. $3/pound. I wanted another bobbin for my Sonata, but there was only one Kromski vendor present! And she only had the dark brown bobbins, not the light ones. I bought one anyway to save on shipping. I’m not overly concerned with the inconsistency in color. Also got a needle felting tool that holds six needles – much quicker than one needle at a time. Found some blank cards with sheepies on them to send as thank-you notes for graduation gifts. It was hard to think ahead far enough to know what I will need in the future, but I’m fairly happy with my acquisitions. There’s also the interweb for emergencies. Yay! Good luck with the skein comp.